Times have changed in the hydraulics industry. 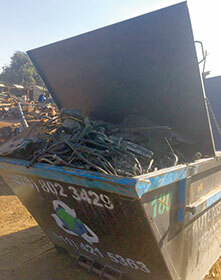 No longer can a used hydraulic hose be dumped in a skip and sent off with the general waste. Motion Control’s editor spent some time with business development manager, Grant Stander at Gauteng Environmental Management (GEM) to find out more. According to the National Environmental Management Waste Act 59 of 2008, any old hydraulic hose must be properly disposed of at an approved landfill site and a Safe Disposal certificate must be received. Non-compliance can result in a fine of up to R10 million or 10 years in gaol or both. Stander says that the Green Scorpions are very active and monitor the general disposal sites to pick up offenders. Stander was appointed by the Fuel Association to meet with all stakeholders and he is currently meeting with SAFPA member companies. Another issue is contamination on the factory floor, caused by oil leaking out of the hydraulic hosing when it is removed. Traditionally sawdust is used to soak it up but Stander says this is not effective. Sawdust is not an absorbent but merely creates mass when mixed with an oil spillage. It results in a sludge which requires a different, more expensive treatment process. Also sawdust is not hydrophobic and if it goes to a general landfill area or factory yard the contaminant can leach out into local water systems and land areas. The right absorbent to use is cocoa husk peat, which will help dry the oil and results in cheaper disposal. Cocoa peat encapsulates the oil in its structure, is hydrophobic, and with adequate oxygen catalyses the natural biodegradation of oil into harmless by-products through microbial action over a period of less than a year. Stander adds that another problem is caused by old hoses lying around on the ground outside, when the summer rain washes off the contamination and then it runs into the drains, where the water table can be compromised. Once you have contamination you have to lift the bricks and dig out sand. And then the samples must be sent to laboratories for testing – this is not a cheap exercise. The Green Scorpions can monitor a company’s drains at any time. The liability is carried by the CEO (16.1) and the representative officer (16.2), who take responsibility. They must show what they did to stop any incident. There is a cradle-to-grave policy and both the hydraulics companies and waste companies (the transporters) are responsible for the hoses for five years. With some companies it is possible to send the old hose back when ordering the new hose. Hydraulic hoses also have a timeline, and unused stock must be disposed of and a Safe Disposal certificate received. The solution is to use a reputable environmental management company to transport the waste to an approved landfill site such as Vlakfontein or Holfontein. At the landfill the steel fittings are cut off for recycling, so the company gets some money back. The hose is treated with ash and lime and is sometimes chopped up. It is important to get references, check their accreditation and go and look at some of the sites. You must know which landfill your waste goes to. All the licences and paperwork must be in order. Some companies will take a prospective client to other client sites so they can see how they are properly handled. It is better to do this regularly rather than stockpiling. GEM gives advice on all hydraulic hose and cut-off steel fittings. With the hazardous landfills currently used by GEM, testing is done for free. GEM also deals with hydrocarbon wastes and hires out technicians to contain spills. There is currently an initiative to recycle the hose into biofuel in the same way as is done with tyres. At R3.50 a litre there is a market for biofuel. However, at this stage it cannot be done economically. The furnace and related equipment cost R5 million. The furnace must cope with the strong mesh and nylon in the hose. Also, there is not enough waste hose generated to justify the labour intensive chopping and the hose would have to be stockpiled. A SAFPA estimate is that 4000 tons a month of hydraulic hose come into the country. There would then also be all the problems associated with stopping and starting a furnace. However, with the advent of modern technology this could become a viable option in the future.